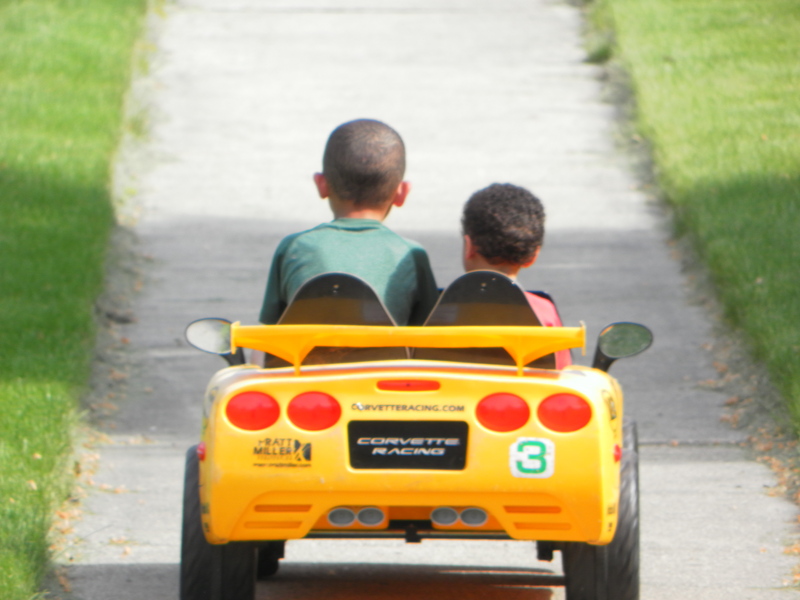 With the warm weather, we’ve pulled out the Power Wheels convertible. We bought it second-hand for Big Brother’s birthday, five years ago. He’s wanted to bring it outside since March. It’s cute how much he loves that car. Too bad it’s sad how he won’t accept the reality that he’s too big for it now. His knees stick up over the windshield when he drives it and I think I hear the electric motor gasping for breath. Once Big Brother gets over his emotional attachment to the car, he’ll realize his bike gives him much more freedom than any rechargeable 12v battery can. It’s just that it may take him another five years to get over his emotional attachment. Blast from the Past: Big Brother taking Buster for a spin, circa 2014. The car needed new battery. New batteries cost more than we paid for the car itself. I’m not sure I would have coughed up the cash to see Big Brother squeeze himself into the driver’s seat one more time. I was thinking more of his little brothers. While Big Brother was finishing up his last weeks of 3rd grade, Buster and Big Man got in some valuable driving time. Buster has an aptitude for driving the car. He doesn’t over-steer and he understands the principles of a three-point (or nine-point) turn. His little brother isn’t quite there yet, but this does nothing to stop Big Man from demanding his turn behind the wheel. He gets his turn, because practice makes perfect – perfect, in this case, meaning less likely to run over your father’s foot. Buster slides into the passenger seat and assumes the role of driving instructor. It’s a comedy on wheels. Buster’s mentoring is laced with annoyed impatience. He doesn’t understand why Big Man can’t follow his simple instructions, never appreciating that Big Man is not listening to instructions, simple or otherwise. Big Man is enjoying the freedom of the sidewalk, then the lawn, then the sidewalk, then the lawn again, then the sidewalk, then Daddy’s foot, then the lawn, and eventually the sidewalk again. It’s peddle to the metal and damn that buzzing in his ear. If Buster knew any swear words his little brother would be buried under them. I must try to remember to forget all my best swear words before the boys get behind the wheel of a real car in 8-13 years. In the end, cooler heads prevail, which means I rescue Buster from apoplexy by informing Big Man his turn is over. With the application of various threats and incentives, Big Man accepts the change and they switch seats. Buster executes a multi-point turn and they embark upon a straight-line cruise down the sidewalk, letting the highway breeze soothe frayed nerves. The Corvette is passed to a new generation: Buster and Big Man hitting the road in 2017. They are friends again, for as long as Big Man refrains from any terrible notions of it getting to be his turn to drive again. I have nearly eight years before the real fun with cars begins. I should spend some of that time practicing keeping my feet out of the way of tires. 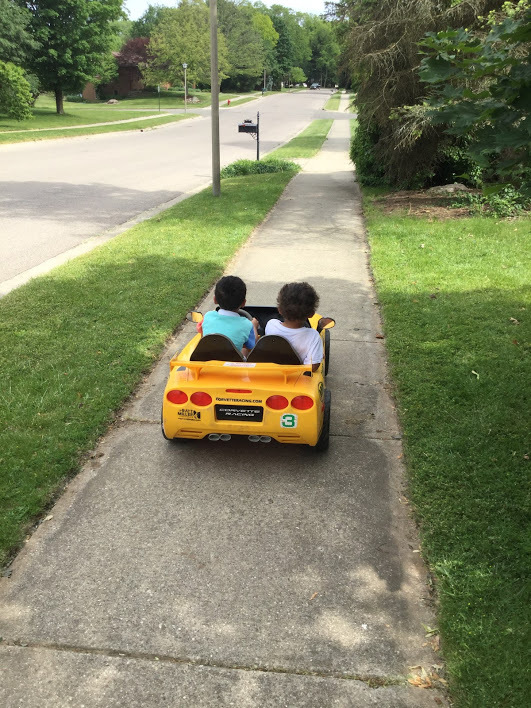 This entry was posted in It's a Guy Thing and tagged boys, brothers, Dads, driving lessons, family, fatherhood, humor, parenting, Power Wheels, Sons. Our nephews have a “gator” (a john deere tractor). They spend 90% of their time needing to get pushed out of ditches. And yet they love it. It’s a good life when somebody else has to push you out of all your ditches. Brilliant and such great memories to look back on by all. Thank you for the smile. I don’t know how many more great memories Daddy’s feet can stand. Thanks for visiting. The cutest! Sounds like Buster may have found his calling…driving instructor/mentor/mixed with a bit of annoyance. Sounds like any driving tester I’ve ever come across! Maybe it can be a side job, after his main gig as Mr. Smarty Pants. Buy steel toed boots sweetie…one of those boys is sure to run over that foot of yours when he gets a real car! Boots? I’m getting a suit of armor. All you have to do is sit in a reclining lawn chair with a scotch for nerves and watch their fun. Then your feet will be safe. Sounds like a headline that would get attention. lol I didn’t say get drunk just one chillaxing drink. My bad. I’ve got to learn to think of you as the voice of moderation. And as he puts the key in the ignition of the Honda, he’ll be longing for his yellow vette and the glory days. Yeah, you should have seen me in my corvette, babe. I rock n rolled that. These are the same thoughts I think about my Big Wheel as I’m puttering along in the minivan. Thanks, Amy. They are simple things, but they mean a lot when we take the time to consider them.